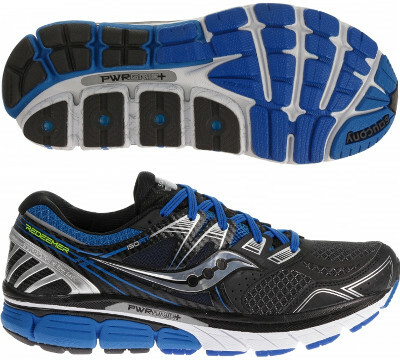 Saucony Redeemer are stability cushioned running shoes. The Saucony Redeemer ISO is the update of the Stabil CS saga because of Saucony's successful ISOFIT™ upper. Designed for heavy runners looking for severe pronation correction, the Redeemer ISO competes with more popular Brooks Beast and New Balance 1340. Orthotics for corpulent runners will fit better in Saucony Echelon models. The Redeemer ISO gets most technologies from its smaller sibling Hurricane ISO with a wider frame and adds TPU pillars design in the medial for increased stability. As seen on other premium running shoes from Saucony, ISOFIT™ upper is basically composed of a flexible external cage cradling the midfoot over a plush inner fit sleeve to move with the runner’s foot in motion. Plush cushioning goes from 6 mm thick insole to SRC impact zone with PWRGRID+™ midsole providing smooth transition. Full ground contact outsole includes an extra vertical flex groove to increase flexibility and features iBR+™ in forefoot for better response and XT-900 in more frequent impact zones to assure longer durability.